One to three minutes shaved off response time to guest requests. Quiet hallways no longer disrupted by the squawk of radios and noisy staff communication. Employees gathering information in just a glance so they can maintain eye contact with guests. Those are just some of the ways hotels are already delivering an efficient and elevated guest experience thanks to the introduction of wearable technology for hotel staff. Researchers at IDC call wearables an integral part of the digital transformation movement as the digital world rewrites the rules of engagement in many industries, including hospitality. Smart commercial watch deployments are growing even faster than wearables in general; IDC projects adoption will accelerate from just 3.3 million units in 2017 to more than 11.5 million units by 2021 — a CAGR of 34 percent. Already, hotels including Hotel Alessandra in Houston and Viceroy L’Ermitage Beverly Hills are seeing real impacts by issuing Samsung Gear S3 smartwatches to their employees. Paired with task management software, smartwatches are transforming the speed, efficiency and sophistication of communications across the many moving parts of hotel operations. Houston’s new Hotel Alessandra chose Samsung Gear S3 wearables and Samsung partner Hipaax’s TaskWatch communication and task management software to avoid the pitfalls of radios or phones. Staff smartwatches silently and instantly whisk guest requests and staff communications right where they need to go. Requests are fulfilled more quickly and response times are down. Room service orders, for example, are delivered to the kitchen instantly, instead of in the five minutes they take in most hotels, according to Safet Dokara, director of operations at Hotel Alessandra. No messages get lost or forgotten, and Hotel Alessandra maintains its ambiance of efficient hospitality while shielding guests from the back-end complexity of running a hotel. “There’s a lot of excitement from both employees and managers because these devices simplify internal communication between employees, and from room to targeted employees. It’s so effective,” Dokara says. Viceroy L’Ermitage Beverly Hills sees Samsung Gear S3 smartwatches as the key to shaving one to three minutes off response time for front desk, bellman/valet, engineering and housekeeping staff via the ALICE task management platform, which Viceroy already uses on smartphones across its portfolio of upscale properties. Cutting that response time “definitely improves the feedback you’ll get from the guest,” says Darren Clark, vice president of technology, driving better ratings and positive word of mouth. “This is going to affect the department’s speed, efficiency and operation. It helps the hotel employees and it helps the guest as well.” Viceroy has already decided to deploy Samsung Gear S3 devices to all properties. Speed of Service: Hotels like the Viceroy are trimming precious minutes off service time because it’s faster to glance at a watch than to take out a phone, activate it and read and respond to a message. Staff members receive and acknowledge tasks in the brief seconds it takes to glance at a wrist. Guest Communications Efficiency: Instead of asking a guest to call in a request to a human operator, wait for it to be conveyed to staff and then wait for the service, hotels are using smartwatches together with task management to accelerate communication. Guests receive prompt feedback, and requests are routed automatically to the closest/most appropriate staff member to speed room service orders, maintenance requests, deliveries and bellman service. Learn how to develop new and innovative wearable apps tailored precisely to your business needs. Staff Communications Efficiency: Staff communications are no longer slowed down by excess radio traffic or delays while an employee takes out a phone, activates it, reads a message and responds. On a smartwatch, a staff member can quickly read and respond to a brief message or use push-to-talk for instant conversation. Hotel Alessandro avoided the need to hire staff just to respond to and dispatch guest request calls. In addition, task management apps can locate the closest or most qualified staff member via GPS functionality built into the watch, then quickly escalate to another person or team if the task is not quickly acknowledged. That provides for rapid, excellent service levels and ensures tasks do not get dropped. 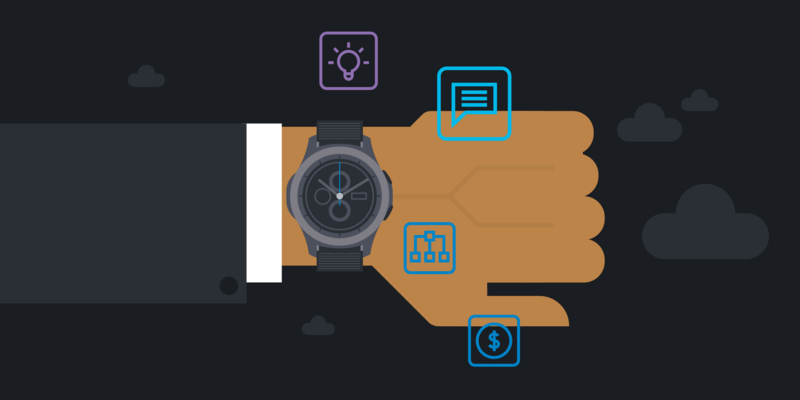 Powerful Analytics: Because staff members acknowledge receipt of a task and report completion, smartwatches with task management provide hotel managers with rich data to manage operations. Combined with time and GPS data, this information enables managers to see how well they are meeting demand in order to better allocate staff and spot training opportunities. Extended Service Area: To engage in instant communications, staff need connectivity. But valet, housekeeping and engineering staff may enter areas beyond the hotel’s Wi-Fi coverage. Wearables such as the Gear S3 offer both Wi-Fi and cellular service to enable instant communication everywhere, even off property, so communication is constant. Eliminating Disruption: Loud, intrusive radio communications disturb guests and staff alike. Smartphones replace these with silent, discreet texts. Staff Attentiveness: To a guest, a work-related smartphone is indistinguishable from a personal device, so they might assume that a staff member is engaged in personal phone use when they are in fact using the phone for hotel business. Smartwatches are tucked discreetly under a sleeve and display instant, brief messages, so staff can remain focused on the guest. Lower Cost of Ownership: Because they are ruggedized, waterproof and secured to the wrist, smartwatches like the Samsung Gear S3 experience less damage than smartphones, which are more often dropped and bumped and therefore require frequent replacements. Devices can be easily managed, maintained and secured directly via the EMM for wearables solution from Samsung SDS America. To succeed with today’s discriminating, digitally empowered customer, hotels must operate efficiently and expediently — while providing a seamless, serene experience to the guest. Smartwatches are quickly emerging as the form factor of choice to meet these exacting demands, enabling hotels to speed service, streamline communications and leverage staff more efficiently and cost-effectively. Visit our hospitality solutions page for more ideas on how to use technology to streamline operations and enhance the guest experience. These 10 essential TV technologies are improving guest experiences across the hospitality industry.